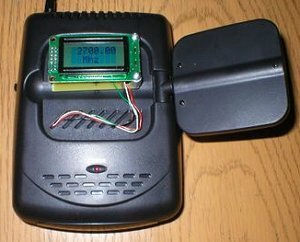 A simple PIC project, the basic model uses a PIC16F628A micro, 16 character LCD display along with a handful of discrete parts. After the mod, the unit will tune from 2.3 to 2.7 GHz continuously. Those parts will cost from $10 - $30 depending on which version you build and where you buy them. Installation is also fairly simple as it involves connecting 4 wires and lifting 2 pins on the unit's original micro. The tuner mod is powered from the Wavecom Jr and is controlled by two switches which adjust the frequency up and down. Continuous frequency scanning is enabled by pressing and holding either the up or down switch for two seconds. The tuner begins by changing in 250 KHz steps. After holding the button for two seconds the tuner switches to 4 Mhz steps. Pressing the opposite switch stops the scan. There is also a narrow scan feature that is enabled by powering up with either one of the buttons pressed. When in this mode, the frequency limits are 2.4 - 2.5 GHz, where most wireless video transmitters operate. The new sync detect option is built on the same perfboard as the tuner and adds one more wire which connects internally to the video out RCA jack. 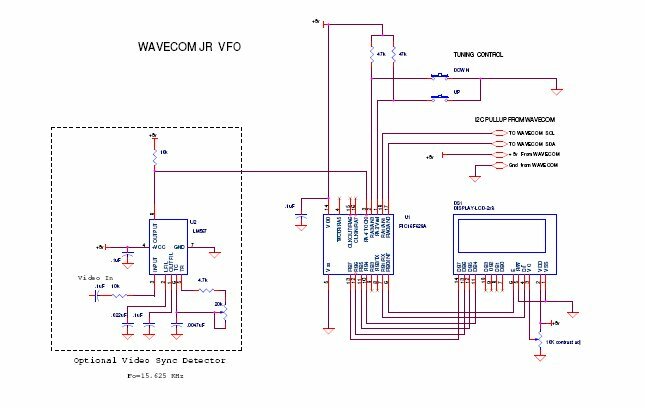 The sync detector uses a LM567 tone decoder IC and will detect the presence of video by looking for the sync frequency. With the addition of a video sync detect circuit, the tuner LCD displays a star (*) and the scan rate slows by a factor of 16 when a video sync signal is detected. The tuner will continue the slow scan rate until the sync signal is no longer present and then resume the fast scan speed. This makes it easy to locate video that you might otherwise miss. 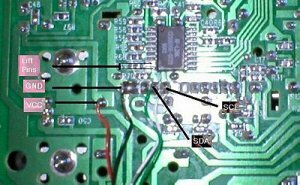 This is the solder side view of the receiver circuit board. Note the four connection wires in the lower left corner. This is a closer view of the area where the VFO is attached. The IC shown is the original tuner that the modification bypasses. This is what my version looks like installed and operating. The receiver now tunes from 2300 to 2700 MHz in .25 or 4 MHz steps. The circular polarized patch antenna can be replaced with a coax pigtail terminating into an "N" connector. 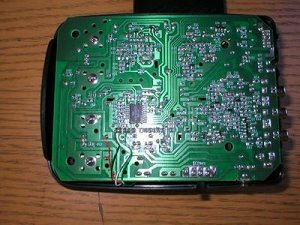 This makes it possible to connect a directional antenna with gain. 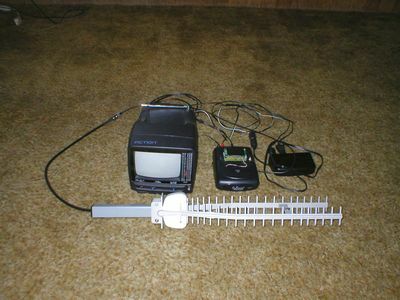 Here's a photo of my complete video scanning rig with a monitor and directional antenna. Updated software remembers the last frequency used. Zipped file packs contains program, instructions, schematics and photos. The HamTV Store sells this neat receiver controller quite reasonably. Combined with this wideband 2.4 GHz (13cm) receiver, a case, antenna and monitor. Presto - a video scanner. Collin Lowe G1IVG has adapted this concept to the Engel video receiver which is sold in Europe and similar to the Wavecom. The software has been modified to operate with the Engel's 479 Mhz IF.